If I haven't said it often enough, let me say it again - I LOVE WEDDING ORDERS. There's just something fun and unique about each individual and for some reason that personality always translates into my drawing. It's like I'm drawing a photograph of the happy couple... I just don't know how to explain it better than that. 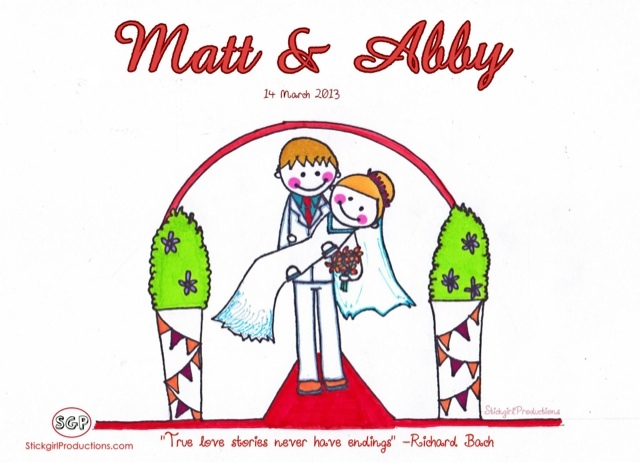 Abby contacted me for a custom made StickgirlProductions wedding portrait. She sent me this quote "True love stories never have endings" by Richard Bach and told me to include it into the design. She then told me her favourite moments of her wedding which I decided to use in my design for her and Matt. Her most fond memory is this as she said this moment shows how her husband is so thoughtful and caring even when she sometimes think he doesn't notice the small things. Abby had injured her foot 3 days before her wedding which made it difficult for her to walk fast. She didn't want to use a wheelchair so she hobbled down (which much grace, I'm sure!) to her charming groom with the support of her father. After the vows, the kiss and the proclamation of Man and wife- Matt swooped in and literally took her off her feet! He then walked out with her in his arms to prevent her from putting anymore strain on her foot. "And that is one of the reasons why I love this man!!!" she exclaimed. I know how she feels to have a husband who takes care of you. I tell Abby she's a lucky one!